There’s a witch on the loose and she can turn our lives upside down. Samantha enjoys toying with us and she switches bodies at will. That’s the challenge Johnny & Marian, Ciaran & Harith and Pat & Babs have to deal with. Three novellas with a common denominator: Samantha the witch! 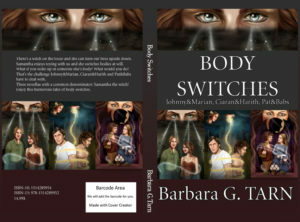 Enjoy this humorous tales of body switches. Ebook links. Paperback available on Amazon, Barnes&Noble and other retailers.